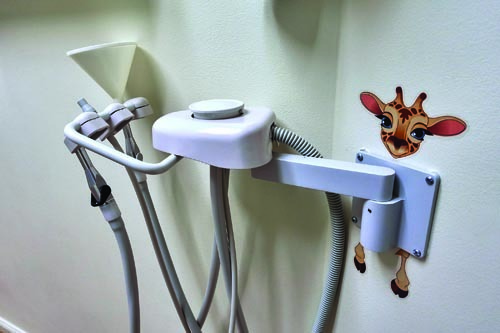 Orthodontists spend most of their working hours in their practices, so they usually don’t get many opportunities to see what it’s like inside another doctor’s office. 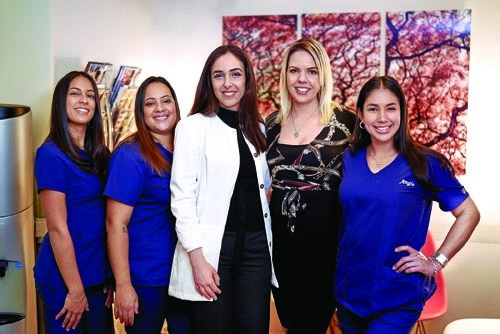 Orthotown magazine’s recurring Office Visit profile offers a chance for Townies to meet their peers, hear their stories and get a sense of their practice protocols. 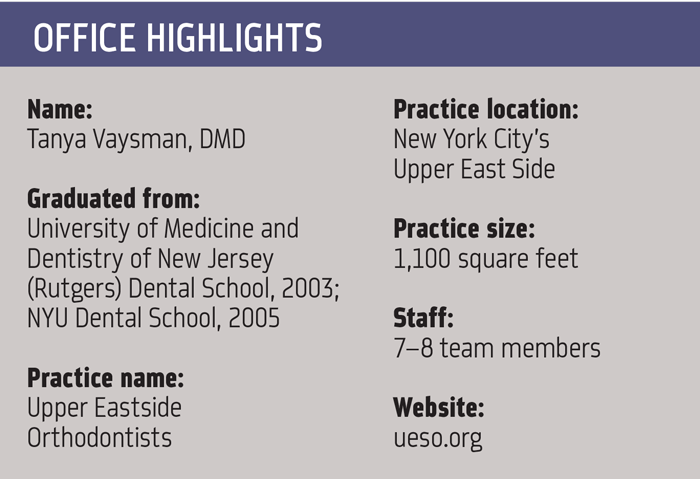 In this issue, we introduce Dr. Tanya Vaysman, an orthodontist practicing in New York City who moved to the United States from Russia when she was 12?years old. Vaysman was randomly selected from all the Townies who completed ballots in the 2018 Townie Choice Awards. In addition to appearing on the cover of this issue, she also received a $1,000 prize from Orthotown. What inspired you to become an orthodontist? How long have you been practicing? I cannot say that being an orthodontist is something that I dreamed of when I was young. I think— like a lot of things in life—it was a combination of luck/circumstances and my vision for what I wanted. I never had braces growing up, because I immigrated to the United States at the age of 12. I did know that I wanted to be in a health care field; I just wasn’t sure which area. When I was applying to colleges, the school that I selected mistakenly placed my application into a seven-year joint dental program. When I was accepted, it was a big surprise to me, because I was not yet certain which way to go. I took this as life sending me a sign, and that’s how my path in dentistry began. Once I knew dental school was in my future, orthodontics was a very clear path. I was always drawn to subjects such as math, physics and engineering. I find solving problems exhilarating, and in our field we spend most days solving problems. It’s all about seeing the big picture. You opened your practice one year after graduating from school, which is impressive. What obstacles, if any, did you face starting so soon? Looking back, is there anything you would have done differently? I purchased my practice less than a year out of residency, which certainly had benefits but also many struggles in the beginning. As I mentioned before, life seems to always point me in the right direction. I was not thinking of ownership at that time, or even knowing what I wanted yet. Like most people, I was working in multiple offices, trying to figure out the profession and its nuances. One day a mentor I knew from residency called me, saying that there was a practice he knew for sale in Manhattan and he thought that I would be a great fit for it. That’s how my 12-year journey began. My husband was a big support for me in making the decision, and you do really need a support team behind you. I knew very little about running a practice, managing staff or anything business-related. It was a steep learning curve. Because I didn’t have a lot of time to shadow another orthodontist, I just did things my way. 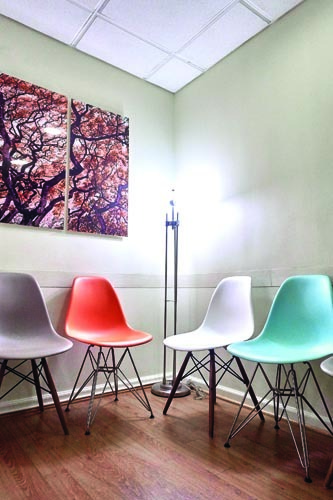 I don’t really have a lot of knowledge on how other people run their practices, which is why I think Orthotown does such a great service by giving us a glimpse into other people’s offices. Looking back, I’m not sure that I would have necessarily done anything differently; only that I might have thought longer about where I wanted to live and be with my family. What you don’t realize is that once you commit to a practice, you’re pretty much committed to living there. But I guess if you can make it in New York City, you can make it anywhere. You moved to the U.S. from Russia when you were 12 years old. Do you believe that helps you practice in a city as culturally diverse as New York? What are some things you’ve learned while practicing in the city? It certainly helped in a lot of ways. New York is a city of immigrants; on any given day, we see patients from probably at least 10?different countries. My background helps me understand the values of some of the parents. In Europe, people grow up with different concepts—they don’t necessarily think that everyone needs to have perfectly straight teeth, and a lot more value is placed on overall health. Coming from a socialized-medicine country, I have a unique appreciation of the modern U.S. medicine system. I think most people who grow up here don’t appreciate the opportunities and choices they have when it comes to their health. 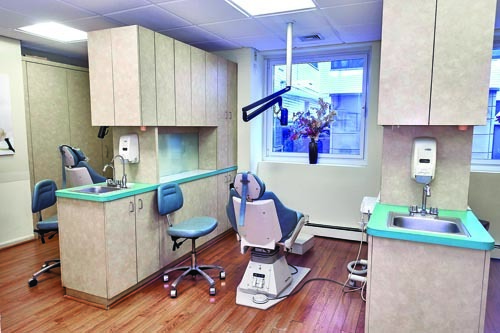 New York is also filled with orthodontic practices, often on the same block as each other. What do you do to set your practice apart from others and market to new patients? Yes, there’s probably an orthodontist practice on every corner in New York—as well as two Starbucks shops on every street and CVS drugstores a block and a half away from each other. But there is still enough business for everyone! Right now, there are three buildings under construction within a half-block of my office, and each one will have a few thousand people. The Upper East Side, where my practice is located, is a more residential area that has a very “neighborhood” feel about it. 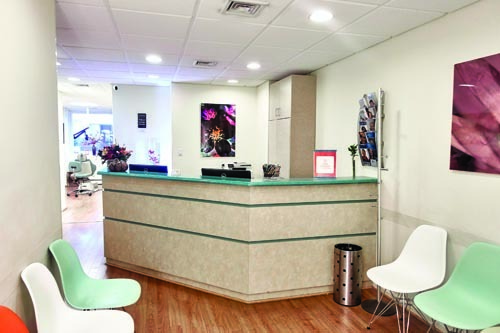 We’ve been there for more than 12 years and we love seeing patients running into their friends in the waiting room, which you wouldn’t think could happen in a place like New York. We do place a lot of emphasis on patient communication; we try to be very accessible to our patients over phone, email and text message. 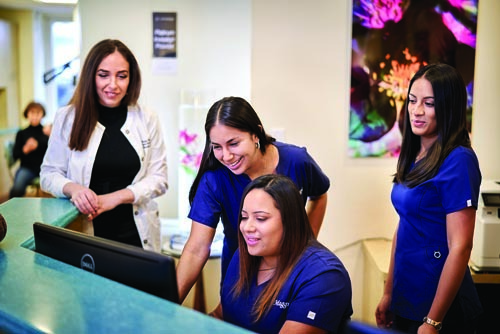 We want to make sure that patients always feel comfortable reaching out to us with any questions that arise during their treatment. You have a perfect five-star rating, which is not easy to obtain, with more than 200 reviews on Google. What’s your secret? 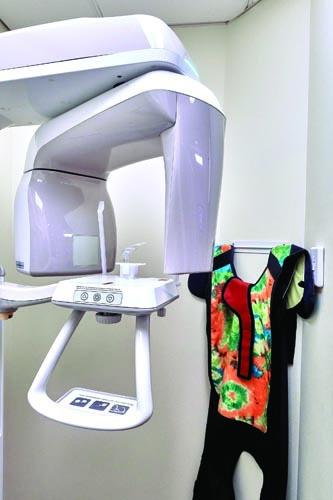 How are you able to keep all your patients so satisfied with your staff and your treatment? I don’t think there is a secret ... and as hard as it is, I had to learn a long time ago that you’ll never be able to make everyone happy. That was one of the toughest things to accept. In our profession, we are very critical of ourselves, and it’s hard to not take it personally when a patient is unhappy about something. We just try to do our best for every patient we see, and I know that’s the most anyone can ask for. What’s an average day like at your practice? Walk us through it. Being in Manhattan, our challenge of space is like nowhere else in the country. We have room for only four chairs and had to learn how to be very efficient and thorough with our scheduling process. We probably see more adult patients than other practices. This creates a nice balance in the schedule, because we can fill our mornings with mostly adult patients and try to focus the afternoons on the kids who are coming from school. Some of our adult patients who usually come during the day can’t believe how different our practice looks in the afternoon hours. You’ve been practicing for more than a decade. What’s something you do vastly different from when you began practicing? What do you hope to incorporate in the next decade? 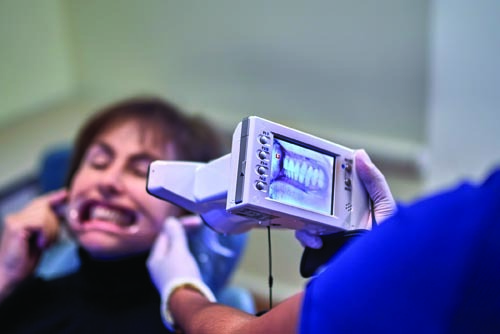 Clear aligner therapy was not the huge thing it is today. Like most practitioners, it was a learning curve to understand its capabilities and to attempt more and more challenging cases. I would love to incorporate in-office aligner printing; I think that’s what will give our profession the freedom that we’re looking for. I still have a lot to learn about it, and I try to follow those topics as much as I can to learn from people who are already doing it. Your practice prides itself on its excellence in technical acumen. 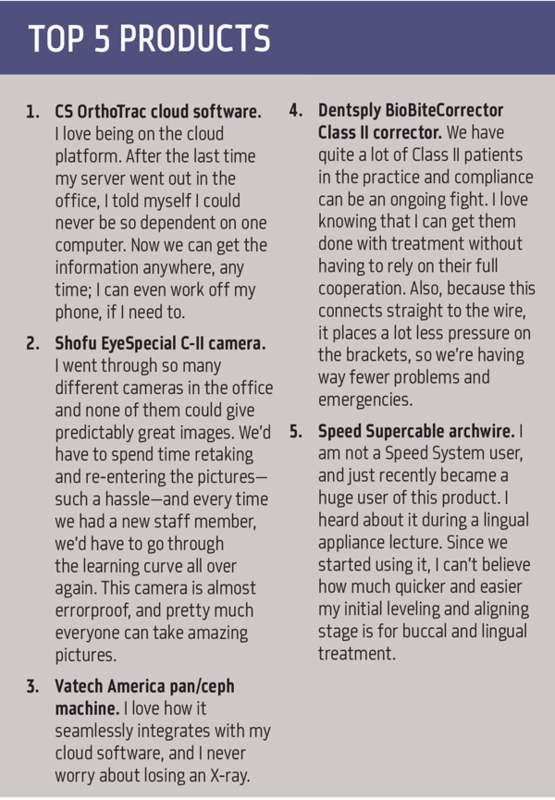 How do you keep up with the latest technologies in the industry? What are some of your favorite advances in orthodontics? Sometimes I find it hard to keep on top of all the new products out there. Between running a practice and having a family, there’s not a lot of time left over for other things. The beauty of being in New York is that there is no limit of opportunity for learning; if you choose to, you could probably go to a different study club every night of the week and still not make it to half of them. 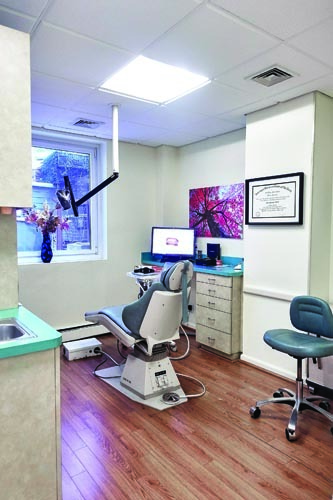 Digital workflow has of course been the biggest benefit to our practice. Being in only 1,100 square feet of space, I have no idea where we would find space to store all the charts and models like they used to in past days. I love having everything in the cloud, with immediate access and peace of mind of it not being lost. What’s your patient treatment philosophy? I’m a big believer in a Phase 1 treatment. Being in practice for more than a dozen years, I’ve been able to follow many patients from Phase 1 treatment, and sometimes even I can’t believe the difference that it made! Kids who I thought for sure would end up having to need extractions end up having enough room with help of early expansion. Sometimes I feel like we almost do too good of a job with early intervention, and that it can be hard to persuade them that they need additional treatment later on because everything falls into place so well. What gives you the most professional satisfaction? I find treating adults sometimes more satisfying than kids in many ways. Kids don’t have the same level of appreciation—they didn’t spend many years feeling unhappy and insecure about their teeth, and they just accept a nice smile as a given. When you give an adult patient that confidence back, it’s a great feeling. 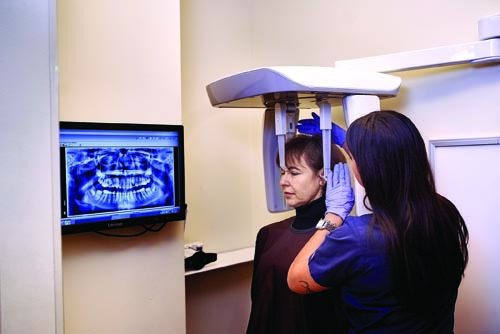 What’s the biggest challenge facing the orthodontic profession? Is this a challenge you’ve experienced? The biggest challenge is all the mail-order aligner companies that have emerged in the past few years. They’re taking advantage of an uneducated public. Like everything new, it will only become balanced when the government starts realizing that its job is to protect the public from harm—just like the FDA controls which foods and drugs are being sold to the public. Some argue that because people choose to accept the risk, it’s OK if their health gets damaged. That should not be acceptable in any country. Tell us about your life outside of the practice. What are your hobbies? Outside the practice, I try to spend as much time as I can with my kids, who are 5 and 7. They grow up and change so fast that we are very much on the time clock with them. When we are in New York, we try to take advantage of the array of cultural experiences that we are surrounded by. New York can wear you out with its fast-paced environment, so we try to get back to nature as much as possible as well. What’s something you’d like to see change in orthodontics, as a profession, within the next 10–15 years? I would love to see our profession binding together more and having a stronger voice and presence than we do now. What advice would you give a new orthodontist entering the field and starting a practice? With the industry changing at a fast pace, it’s almost impossible to predict what the profession will be like in 5–10 years. Make sure you’re really committed to the area you choose to practice in for the long haul, because changing locations is very difficult. I’d also recommend surrounding yourself with a great support system and staff. No one can do everything alone.